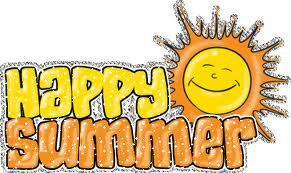 Tomorrow (June 21st) is the first official day of summer! Unfortunately, that doesn’t guarantee we won’t see anymore snow here in Wyoming, but it does mean the weather is getting better! We have such beautiful summers here AND we avoid the blistering heat of the south! Believe me, I lived through 25 summers in the south and it gets HOT there! What are your favorite summer activities? Do you like to grill out and have company over? Do you enjoy fishing? Whatever it is you like to do, enjoy yourself and have a little fun, because IT’S SUMMER!